Apple has finally broken its Safari browser out of beta and is boasting the world's fastest webpage loading experience to boot. Safari 3.1 available for Mac and PC today also adds support for Web 2.0 features such as HTML 5, audio-video tags and CSS animation, among others. 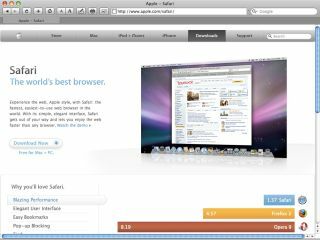 Apple claims that Safari 3.1 can now render web pages 1.7 times faster than Firefox 2 and 1.9 times faster than Internet Explorer 7. Our PC supremo Dan Grabham has put that to the test with a hands-on. It is, of course, in Apple's interest to develop a speedy cross-platform web browser. The company's keen to build developer support for the iPhone and iPod touch, both of which use Safari for web browsing, as well as for delivering web-based applications. You can see the evidence for this in the new 'Show Develop menu in menu bar' option under the Advanced tab. This enables web developers to ensure that their sites render correctly with Safari. It also enables the browser to pose as one of its rivals - handy for when a website has only been configured to run on limited types of browser.